We recently went on an excursion to Cahors, medieval capital of the Quercy Region and now Préfecture of the Lot Département. Friends Kate and Nigel have a house near Cahors and came with us to point out some of the newer sights. See also my post More of Cahors. We are about 55 minutes’ drive away, but Cahors is in another département, and therefore on another planet, so we don’t go as often as we’d like. We saw quite a lot of it as tourists holidaying in France in the 1990s. Much of it has remained the same, but there are some notable changes too. The first of these is the introduction of a park and ride system, not generally widespread in France. This meant that, instead of driving around the town 15 times before squeezing into a tight space while holding up the impatient traffic, we sailed along a riverside boulevard to an immense, virtually empty and free parking area only 5 minutes’ walk from the town centre. For those who don’t wish to walk, a navette (shuttle bus) is laid on. Cahors is noted for its old town, which extends to the east of the main street, the Boulevard Gambetta. Nestling in a loop of the River Lot, the town has remained largely within its medieval boundaries. Cahors was a notable financial centre in the middle ages, populated by Lombard financiers and wealthy merchants. 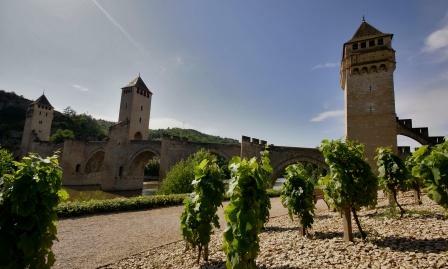 The Lot was an important commercial waterway and carried the so-called ‘black wine’ of Cahors, the town’s main claim to fame, down to Bordeaux (coals to Newcastle?). The second significant change in recent years is the establishment of a series of secret gardens, linked by a marked trail, throughout the town. 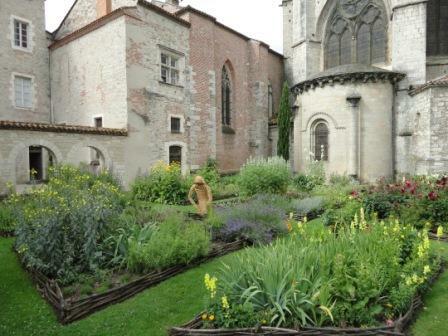 Some are planted in established sites, such as the cloisters of the Cathédrale Saint-Étienne, while the town has reclaimed areas of waste ground to create others. Often adorned with contemporary sculptures and murals, the town council’s aim was to recreate medieval herb and physic gardens and to cultivate plants that would have been familiar to the inhabitants in the Middle Ages. They are usually peaceful and pleasant places, but some of them are already defaced by the mindless graffiti and vandalism that is the leitmotif of most European towns today. We spent an enjoyable morning following part of the gardens trail and taking in the well known and some of the lesser-known sights. The old town is riddled with narrow streets and alleyways, with the upper storeys of the medieval buildings jutting out over the pavements below. There are some wonderful examples of medieval facades, with colombage facings (brick and timber sections between the stone walls). 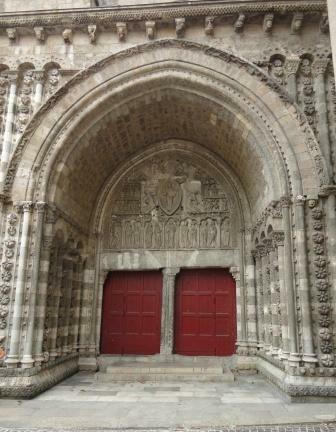 Intricate stone carving and elaborate doors and entrances testify to the town’s historical prosperity. How many excursions take in an underground car park? Before lunch, we descended from the Place Mitterand into the ultra-modern, state of the art multi-storey car park, completed only recently. 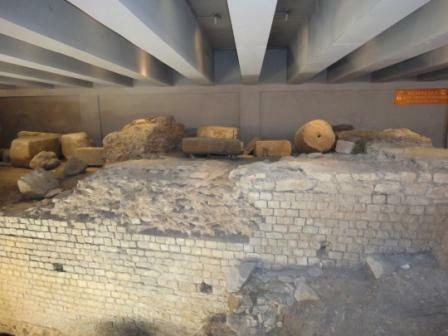 The reason for this unusual diversion was to see the Roman remains excavated during the building of the car park and carefully preserved along one wall. Cahors is stuffed full of the remnants of Roman buildings. The Romans took over the existing settlement from the indigenous tribe, planted vines and put the place on the map. After several kilometres’ walk in the hot sun, we were ready for lunch. Kate and Nigel introduced us to their favourite Cahors restaurant. I am forbidden to pass on its name and location lest the Brits invade it and we incur the wrath of K&N (although if you really want to know, I am open to bribery). I am going to tell you what we ate, though, because it was very good and I tend to use menus as milestones in my memory. We started with very thinly sliced, delicious Limousin beef with Parmesan shavings (a bit like carpaccio, but cooked). The others continued with roast veal, but I had steamed cod with seasonal vegetables and aioli. Instead of pudding, my husband asked for cheese (not on the menu but willingly provided). I had a chocolate feuillantine since I can never resist chocolate. Washed down with carafes of Cahors red and rosé and finished with coffee, a delicious sense of well being descended on us. However, the sightseeing was far from over. Next up was a visit to the Musée de la Résistance, which chronicles a sombre period in French history. The museum is on three floors and, since it was a baking hot day and the building is not air-conditioned, we could manage only two before deciding that we would have to come back another day to finish it off. The effect of the heat was exacerbated by the noisy preparations for the Cahors Blues Festival that were taking place outside. The exhibits consist mostly of contemporary documents – newspapers, reports, photos, etc – and you do need to be able to read French to appreciate them fully. We also felt that the museum rather glossed over the sometimes-fierce internecine struggles between different branches of the resistance movement and made it appear more coherent and cohesive than it actually was. Cahors is a bustling place and the central main street, full of shops and cafés, while not particularly restful or picturesque, is certainly vibrant. The town boasts two markets per week (Wednesday and Saturday) around the market hall and the cathedral, where you can buy anything from artichokes to zucchini. Local produce includes foie gras, goats’ cheese, lamb from the causses and local vegetables of all shapes and sizes. Jamie Oliver was spotted there a few months ago, while filming his latest series. This was misleadingly entitled ‘Jamie does…the French Pyrénées’ – Cahors is nowhere near the Pyrénées. We weren’t there on market day but will do that another day, along with the rest of the Resistance Museum. Well worth a visit. Interesting sights; some excellent restaurants (also the inevitable tourist traps); a well-stocked market and some bijou shops; and the town council has made an effort to preserve and enhance the place. Why isn’t Montauban (our Préfecture in Tarn-et-Garonne) like that? This entry was posted in Food/drink/recipes, French life, History, Places and tagged Cahors, France, history, living in France, Lot, restaurants, SW France, wine. Bookmark the permalink. Would love to know the name of that secret restaurant??? What’s it worth, Wendy?!! If you really, really want to know, I’ll send you an email. But don’t let on to Kate and Nigel that I told you.